While out on a stroll along a stream to the south of Buenos Aires, Argentina, Jose Antonio Nievas spotted something peculiar sticking out of a riverbank. The object was greenish and pebbly, and at first Nievas thought he had discovered an enormous dinosaur egg. He was wrong. After popping out for some fresh air, farmer Jose Antonio Nievas stumbled across what experts believe are the remains of a prehistoric giant. With a little more excavation, the unusual find turned out to be something much more recent: a nearly complete, metre-long shell of a beast that trundled around South America over 10,000 years ago! 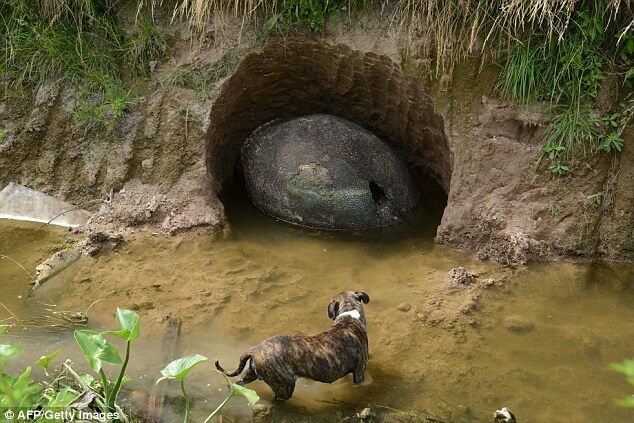 Experts who saw the photos immediately suggested that it was a glyptodont shell. Such species are the ancestors of modern armadillos, which also have armoured shells. While they’re superficially similar to their relatives, the armadillos, in having body armour made of bone, the glyptodonts had solid, rounded domes for shells rather than the more flexible bands of their cousins. More than that, many glyptodonts had caps of bone over their skulls to help protect them from jaguars, sabre-toothed cats and other predators of their time. Some species, such as Doedicurus, took defence to the extreme with mace-like tail clubs. These strange mammals evolved in South America over 18 million years ago, back when the continent was an island separated from other landmasses. This isolation led to the evolution of not just the glyptodonts, but also other oddities, like giant sloths, terror birds and more. By about seven million years ago, though, South America became connected to North America by the Panama land bridge. The glyptodonts maintained their stronghold to the south, but they were also one of the few groups to find success in North America.